With three electric motors and a gasoline engine, the Acura NSX’s powertrain can charitably be called: complicated. Why the superabundance of motors? 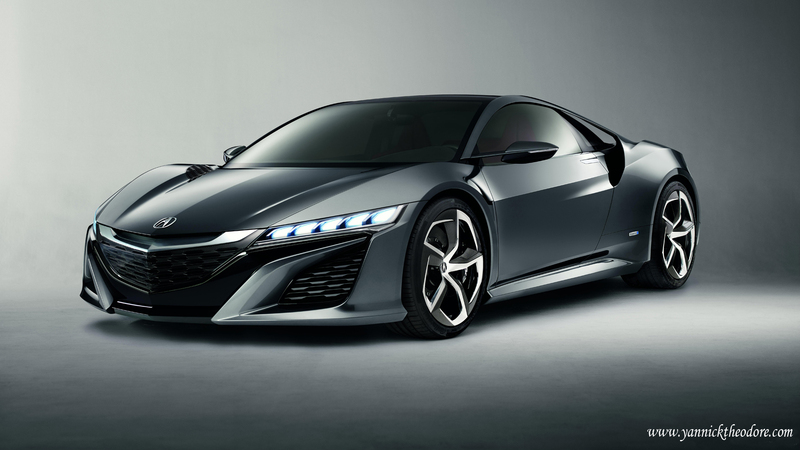 Well, like the marvels of modern science, the McLaren P1 and the Porsche 918 Spyder, the NSX is a hybrid. The NSX has one electric motor at each of the front wheels and one on the rear axle. With all those motors the NSX is, as you would expect, all-wheel drive. Unlike mechanical AWD systems, which are limited by the petty constraints of friction, the NSX will be able to respond at the speed of light. And because it uses separate electric motors for the front wheels, the AWD drive system can actually assist with not just handling but steering by sending continuously variable amounts of positive and torque to the wheels during hard cornering. Like the original NSX, the majority of the power will come from a special race-derived twin-turbo V6. Even for a race-derived engine, this 3.5-liter is unusual. It purportedly uses an extremely wide angle between the cylinder banks, almost like a boxer motor. While this makes it less compact than narrow angle engines, it reduces vibration and allows the engine to rev higher, which is an important feature in an engine that has to both provide power directly to the wheels and charge batteries. The supercar is likely to feature a dual-clutch transmission with seven gears.